The bodies of slain villagers are transported from Say Taung village to Buthidaung Hospital on Friday afternoon. Upper House lawmaker U Maung Kyaw Zan of the Arakan National Party (ANP), who went to Say Tang village on Friday morning, confirmed that five bodies were found, and that eight villagers had been wounded and were receiving medical treatment. Say Taung village is currently housing more than 2,000 people who fled neighboring villages due to armed clashes in the area. U Maung Kyaw Zaw speculated that the victims had been shot dead while hiding in a bomb shelter. “If [they had been killed by] artillery shells landing in the bomber shelter, their bodies would have been blown to pieces,” the lawmaker said. U Maung Tun Aung, a resident of Say Taung village who managed to escape, told The Irrawaddy over the phone that Myanmar Army troops surrounded the village at about 3 p.m. on Thursday. At around 9 p.m., an Army unit entered the village while firing on homes with both small arms and artillery. Spent 73-mm (with Burmese writing) and 40-mm rounds found in Say Taung village. Even in the morning, they continued firing into the village, prompting most of the villagers to try to escape. Monk Narya Ka, who also traveled to Say Taung village on Friday morning, said that each of the bodies found in the bomb shelter had at least two bullet wounds to their heads and/or torsos. The victims were identified as Maung Aye Tun, 54, Ma Than Nyunt, 53, their son Myat Swe Thein, 23, and nephew Maung Aung Than Htay, 17, and a blind elderly woman, Daw Hla Nu Phyu, 88. “A 10-year-old girl, Khinzar Tun, a Grade 5 student, was the only one spared during the killing [in that incident]. She is with us now on a motor boat and we are taking care of her at the moment,” the monk said. 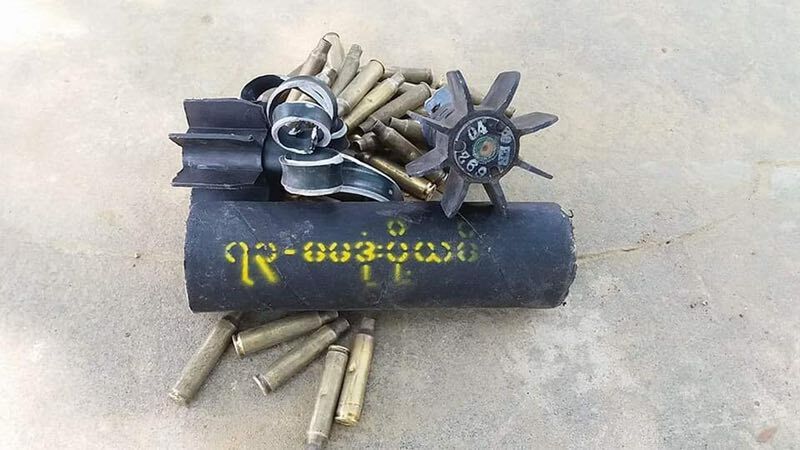 After the fighting, villagers found spent bullet casings and artillery shells believed to be products of a Myanmar military munitions factory, as some had Burmese writing on them. Daw Bu Lone Ma, who also managed to flee the shooting, recalled that soldiers entered the village from four directions. At 9.00 p.m, many villagers were visiting their neighbors and many children were watching movies at a local TV booth. Then gunfire started at 9.30 p.m. and didn’t ease until about 12.00 a.m.
“This was so terrifying; we have never experienced this before. They were shouting f***ing Rakhine come out!” in Burmese, she said. According to her, four head of cattle were also shot dead with small arms. Several villagers contacted by The Irrawaddy said Army soldiers intentionally fired into the village from four directions, so that anyone attempting to flee was in danger of being shot. A statement issued by the Office of the Commander-in-Chief on Friday afternoon said the government troops were responding to AA attacks launched from the village. It accused the AA of using a civilian settlement as cover. Daw Bu Lone Ma said, “There were no AA in our village. That is absolutely wrong.” She added: “I recognized the number 22 [printed on the soldiers’] assault rifle stocks.” Soldiers in the Myanmar Army carry rifles with their unit numbers printed on the butts. Ko Naing Oo from Zaydi Taung said many locals from Say Taung village sought refuge in his village just a mile away. He had heard about the shootings and the arrival of displaced villagers and was preparing to evacuate his family to a safer location as soon as possible.